ZZYZX, CALIFORNIA–Our second and last stop of the day was Amboy Crater, which is about halfway between Barstow and Needles, California, near Route 66. Meagen Pollock, our ace petrologist, prepared us well for this visit, so we’ll wait for her to post the geological details and her expert observations. I want to prepare the ground with some photos of our hike up this remarkably recent cinder cone. Wooster geologists walking across the lava field to Amboy Crater. 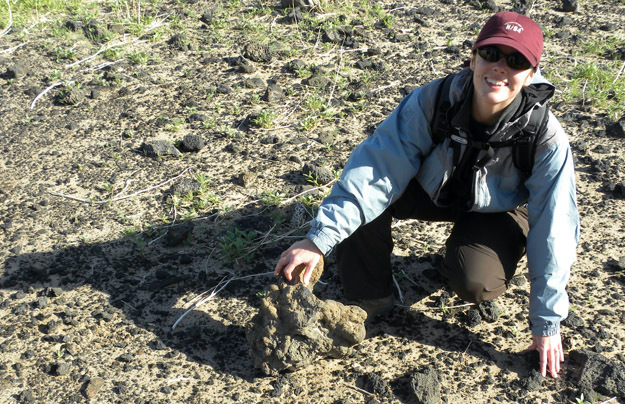 A very happy Meagen Pollock with a volcanic bomb tossed from Amboy Crater. Wooster geologists on the rim of Amboy Crater trying very hard not to be blown down either the steep slope into the crater or the steeper slope down the outside.